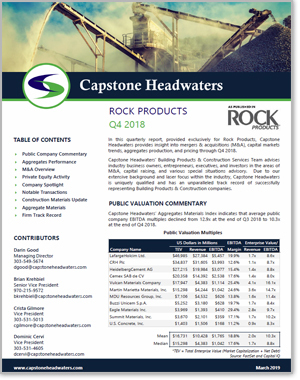 In this quarterly report, provided exclusively for Rock Products, Capstone Headwaters provides insight into mergers & acquisitions (M&A), capital markets trends, aggregates production, and pricing through Q4 2018. Capstone Headwaters' Building Products & Construction Services Team advises industry business owners, entrepreneurs, executives, and investors in the areas of M&A, capital raising, and various special situations advisory. Due to our extensive background and laser focus within the industry, Capstone Headwaters is uniquely qualified and has an unparalleled track record of successfully representing Building Products & Construction companies.